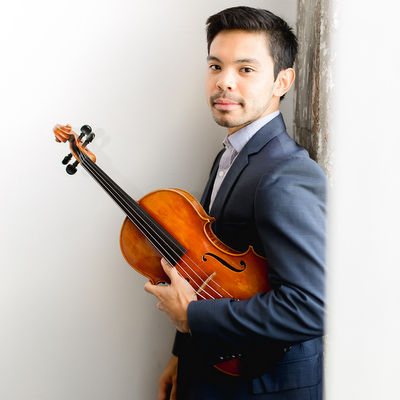 A native of Miami, Florida, violist Sergein Yap studied with Ivo van der Werff at Rice University’s Shepherd School of Music, with Martha Katz at the New England Conservatory, and with Jeffrey Irvine and Lynne Ramsey at the Cleveland Institute of Music. In 2016, Mr. Yap was selected as a Zarin Mehta Fellow with the New York Philharmonic’s Global Academy Fellowship Program. Summer festival appearances include the Banff Centre, ENCORE School for Strings, Heifetz International Music Institute, Kneisel Hall, Music Academy of the West, the Perlman Music Program, Sarasota Music Festival, and Tanglewood Music Center. Recent chamber music collaborations include performances with Brian Connelly, David Halen, Richie Hawley, Paul Katz, Roger Tapping, and David Coucheron. Mr. Yap has also been featured in recitals through the Carl Flesch Academy in Baden-Baden, Germany, and the Summer Academy Bad Leonfelden in Austria. Mr. Yap is a core member of Loop38 and the KINETIC Ensemble and performs regularly as a substitute with the Houston Ballet and Houston Grand Opera orchestras. Mr. Yap is on faculty at the University of St. Thomas and serves on the executive board of the Houston Viola Society. Highlights for the 2018-19 Season include performances with KINETIC, Loop38, Melos Sinfonia of London, England, MUSIQA, and Da Camera’s Young Artist Program.